Do you remember the corner of 39th and Summit and a theater that showed Mexican movies? In 1940, the Roanoke Theater near 39th and Summit was a typical neighborhood theater. But by the end of the decade, it had changed its format to show Mexican movies, attracting huge crowds from across Kansas City. A 1909-1950 Sanborn Fire Insurance map shows businesses at the corner of 39th and Summit and homes along 39th Street, Clark Street and 39th Terrace. The Roanoke at 813 W. 39th Street was one of Midtown’s early neighborhood theaters. It also drew large crowds after 1946 when it started showing Mexican movies. The theater which no longer exists sat just off the corner of 39th and Summit, where Missie B’s operates today. It is part of the block we’re featuring in our look back at Kansas City. As part of our Uncovering History Project, the Midtown KC Post is taking a look at the 1940 tax assessment photos of each block in Midtown. This week we’re focusing on the blocks from Summit/Waddell to Clark, from 39th Terrace to 39th Street (Schaefer Avenue). (Many people seem confused by the tax assessment photos, which all include a man holding a sign. Here’s the story behind them). In 1973, the Kansas City Star showed James Nichols taking corned beef and cabbage off the menu at Nichols Lunch, where is had been served since 1921. A meat shortage made it impossible for the restaurant to serve the popular dish. The building on the corner is missing from the 1940 tax assessment photos, but in 1952 the Gusson Drug Store stood there. Summit became known as Southwest Trafficway in the early 1950s. The cluster of commercial buildings at the corner also included Austin’s Garage in 1940. Another favorite business on the commercial corner was Nichols Lunch at 3906 Summit, started by Frank Nichols in 1921. John’s Barbershop was another neighborhood service once located there. At some point, the name of the theater was changed to the Tampico, as seen in this 1953 advertisement. 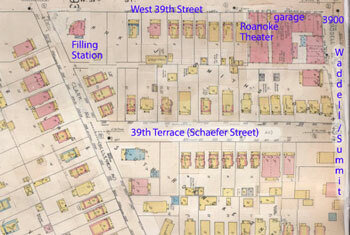 The Roanoke Theater served the nearby residents beginning in the first decade of the 20th century. In the 1930s, it was the scene of labor troubles and made national headlines when it was bombed in 1937. Then in 1945, the Dickinson movie chain had the idea to introduce Mexican motion pictures. “… these are not the Hollywood pictures made with Spanish subtitles which are sent to South America. These are motion pictures made in Mexico, produced by Mexican companies, starring Mexican actors and actresses, written by Mexican writers who adapt literature of Europe and America to the screen. The pictures are imported through ordinary business channels by enterprising exhibitors who realize there is a need for such pictures in the United States,” The Kansas City Times reported in 1946. Dickinson tested the idea by showing one at the Kimo Theater, 3319 Main, two nights a week. “In less than a month, crowds had become so large that they not only overtaxed the seating capacity of the house, but they literally stopped traffic on Main Street,” the newspaper said. 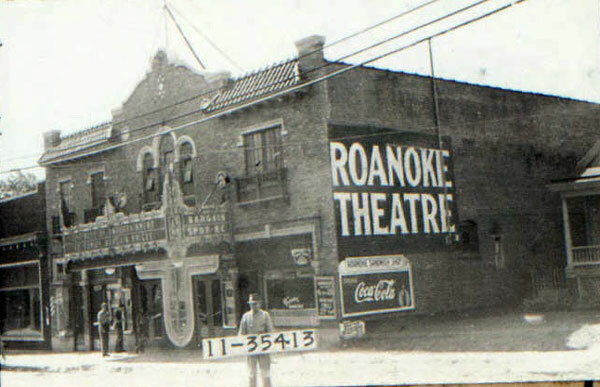 So to handle the crowds and to provide easy access on the street car route to Spanish-speaking residents, the theater moved the Mexican movies to the Roanoke, where they showed seven nights a week. The rest of the block from Summit to Clark from West 39th to West 39th Terrace (Schaefer Avenue) seen in the slide show below was made up of homes except for a gas station at the corner of 39th and Belleview. Do you have memories or more details about this block of the Volker neighborhood? Please share them with our readers. When I was growing up, that theater at 39th and summit was called the Tampico, and yes, it showed Mexican movies…the large red building across the street was Summit cleaners. People from all over brought their dry cleaning there.